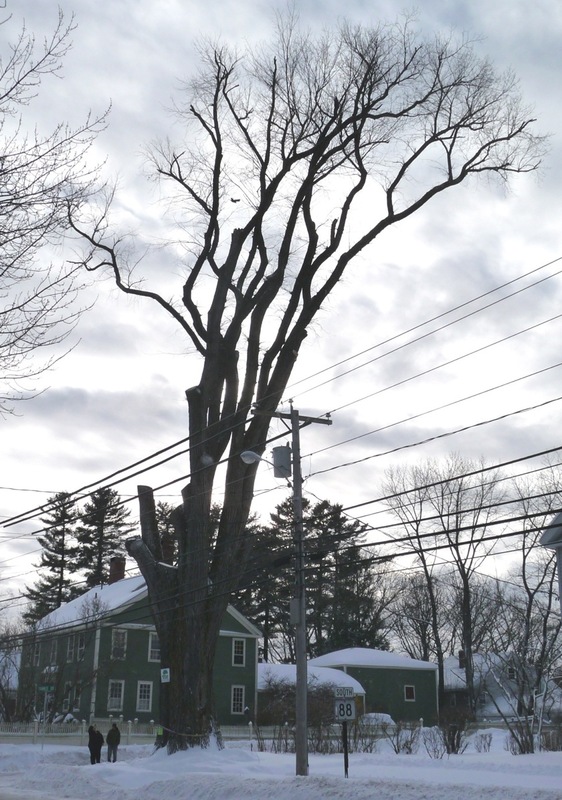 I was in Maine last week, and planned to stop in Yarmouth on Monday to watch the removal of Herbie, the champion American Elm (Ulmus americana) that had finally become too compromised to stay standing. 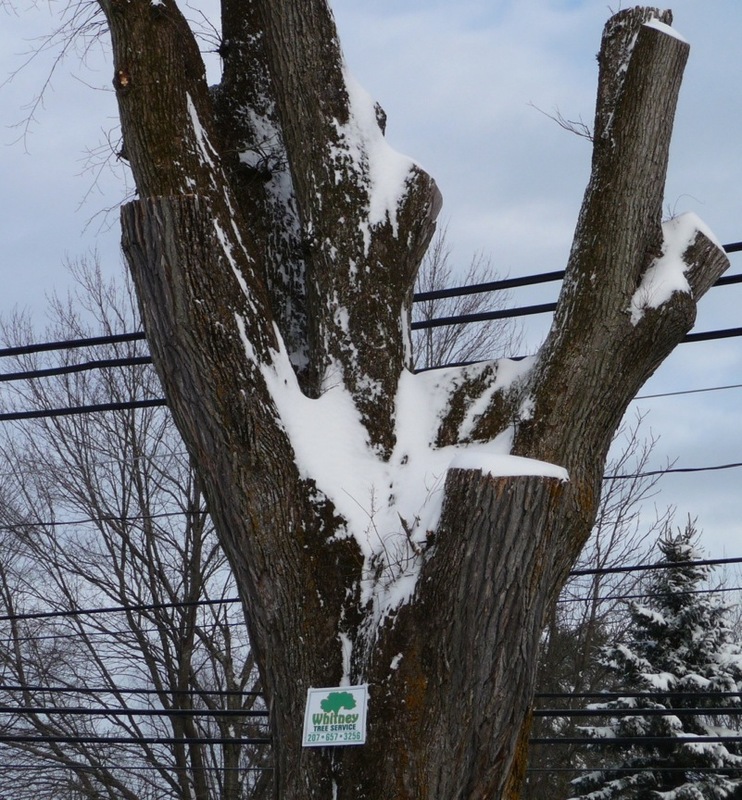 For several months, stories about Herbie and his long-time steward, Yarmouth tree warden Frank Knight (at 101 years old, he is now retired) had been appearing in the news — Knight had cared for Herbie for over 50 years, and had treated the elm in repeated battles with Dutch Elm Disease. He had succeeded for decades, but in recent years the disease and old age had been catching up, infecting whole limbs and making it necessary to remove large chunks of the tree’s crown. Last summer, the town’s current tree warden, Debra Hopkins, determined that Herbie should come down, and Knight concurred. The date of removal was set for January 18. There were reports that arborists and Herbie-fans from around New England would show up to watch the proceedings. As I would be driving past Yarmouth that day, I decided to join them. Work was slated to begin at 7:30 a.m.
Fortunately or not, a heavy snowstorm started on Sunday night, and when I awoke at 5 on Monday morning several inches had already fallen, with no end in sight. A couple of tasks delayed my departure by several hours, and as it seemed unlikely that the work would proceed that day anyway, I didn’t arrive in Yarmouth until about 2:30 p.m. Herbie still stood. As I drove up, several people were snapping photos of the tree; more showed up when they left, and still more arrived as I was leaving. Lots of people wanted to get a last look at this giant. 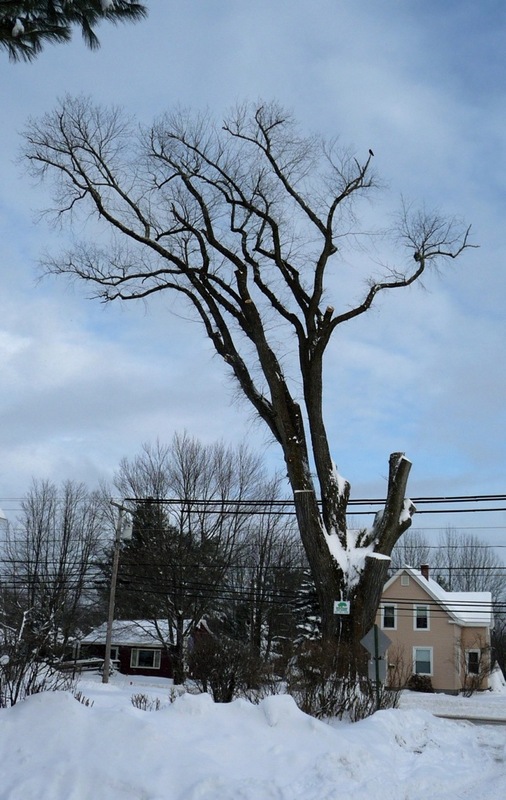 Herbie the American Elm, on the day scheduled for his removal. Herbie was massive — in his prime, he stood 110′ tall, with a crown spread of 120′ and a girth of 20′. Disease and age had diminished him, and it was clear that this was a tree under serious stress, but it was impossible to stand next to or near him without feeling awe. To get a sense of the tree's scale, note the people standing to the left of Herbie. 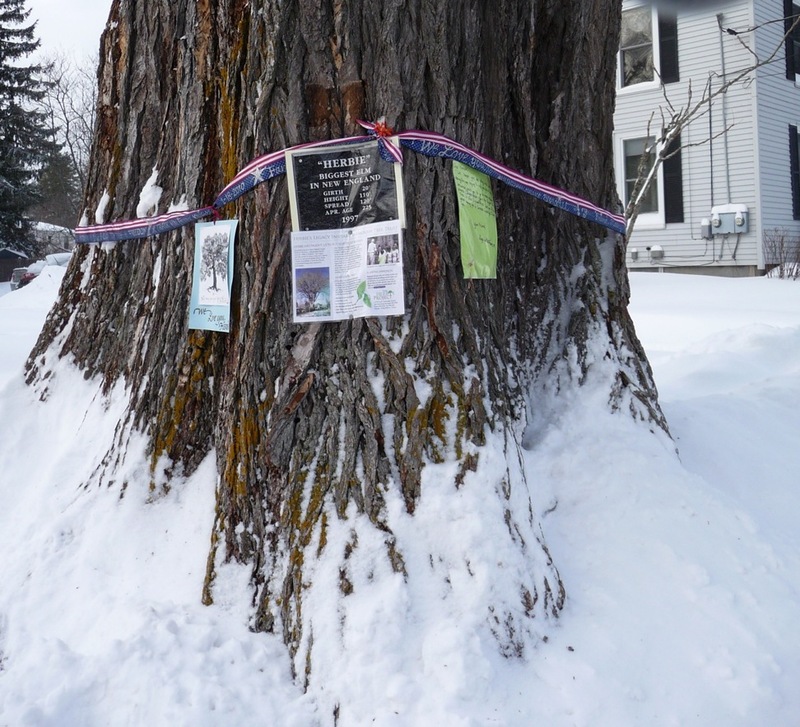 Someone had tied a red, white, and blue ribbon around the tree, and people had attached cards and well wishes and information on this champion to it. The placard in the middle is an 8.5" x 11" sheet of paper, with facts on Herbie's size and life. The tree had quite a lot of evidently viable growth in the canopy, but the canopy itself had been hugely compromised, with several very large limbs removed. I remember hearing Alex Shigo talk about how and when to make the decision to remove a tree; he spoke eloquently about the native dignity of trees, and about how at some point the act of removal shows more respect for the tree than leaving it in place. There comes a point in a tree's life where removal of this much of its crown is a removal of dignity, as well. Though the tree's trunk appeared to be sound, and the limb removals had eliminated hazard wood, Herbie's time had come. For about 15 minutes, I ran around in the cold photographing Herbie from different angles. As I did, I saw carloads of people arrive, jump out, snap photos of themselves with the tree, put a hand out to feel its bark, and then gaze up at it reverently before they left. And then I went over, put my hand on the craggy, lichen-speckled bark, and also said a silent goodbye. Herbie in his heyday. 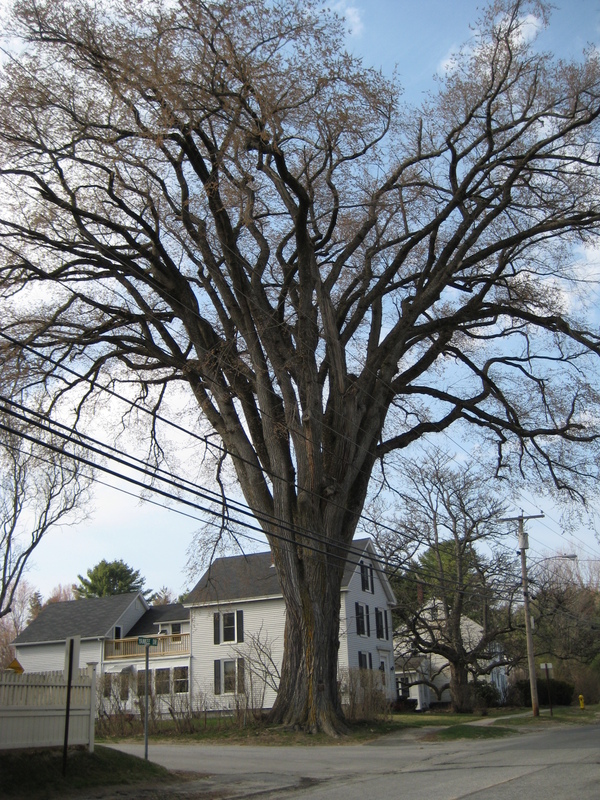 This was a classic American elm. Herbie was taken down the following day, with Frank Knight in attendance. To see removal photos and videos, as well as how the wood from this elm will be used, click on this link. what a beautiful story and wonderful history that herbie and frank shared… thanks so much for posting on this.